Click on the Player Licencing card to see all the Licence Pools that you own. This will show all the devices that are currently licensed against this Licence Pool. Once clicked a table will open to show further details including the Device Name, Version and Last licence check. Removes devices that are no longer in use. 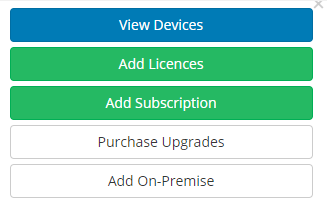 Enables you to specify if your device should consume a subscription licence, or a perpetual licence. You may wish to do so if you want to take advantage of subscription licence included upgrades to newer versions for certain devices, or to licence ‘temporary’ devices from your subscription licence allocation. Additional licences can be added to an existing Licence Pool by clicking this button. A new window will open which will allow you to select the number of additional licences required and take you through the transaction process. This button allows you to add additional subscription licences to an existing Licence Pool. A new window will open which will allow you to select the number of additional subscription licences required and take you through the transaction process. On clicking the Purchase Upgrades button a new window will open which allows for you to specify the Version and quantity of upgrades required for purchase and take you through the transaction process. Once purchased you need to Upgrade your Players so that they will automatically migrate between Licence Pool versions and consume upgrade licences as necessary. Please note: Licences are available for purchase at the ‘latest version’ and are automatically downgraded to match a Licence Pool of an older version as required if you want to run older Player versions. This results in an upgrade licence being issued which can be used for upgrading in the future. A customer has a 1.8 series CMS and some 1.8 series Players and needs an additional 1.8 licence. The customer purchases an additional licence, which currently means a 2.0 series licence is issued. On using this licence to connect another 1.8 series Player to the existing licence pool, it will automatically downgrade the purchased 2.0 licence to a 1.8 series licence so that their device can be licensed. This situation will also issue a 1.8 - 2.0 upgrade so that the customer can upgrade in the future and use the licence on a 2.0 series device with no additional charges. Click on this button to add the Module to your CMS to allow licensing from your Xibo CMS via file exchange. A new window will open which will detail the Terms and Conditions and take you through the transaction process. Once purchased, please refer to the On-premise Module page for activation information, from the left hand menu.